Dodgy At Best: Landis Wins Epic Tour De France With Ride For The Ages. Was It On The Up & Up? Landis Wins Epic Tour De France With Ride For The Ages. Was It On The Up & Up? 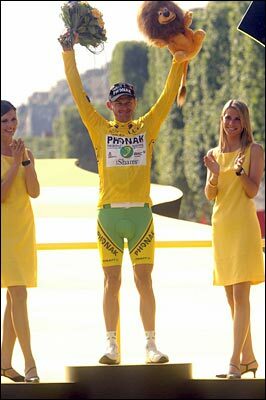 So last weekend Floyd Landis finished the job after his amazing comeback in stage 17 from his amazing bonk in stage 16. He went over the top in Saturday's time trial and cruised to victory on Sunday. None other then Lance Armstrong is now lobbying his ex-teammate to join the Discovery team that Lance is a part owner in. According to OLN's Paul Sherwin, after Landis' stage 17 heroics "one of the first people to call him was his ex-team-mate and former 7 time Tour de France winner Lance Armstrong who told Landis he had the biggest balls of any cyclist he had ever met to even think about pulling such a move." He is the 3rd American to win the race. Amazingly, Americans have now won 11 of the last 21 races dating back to Greg Lemond's first TDF win in 1986. That's pretty dominant when you consider that not a single American even rode in the TDF prior to 1981. Exactly, man. This whole 110% thing has been a huge pet peeve of mine for years, so I took an immediate liking to him after reading the article. Plus he is a great story with his degenerative hip and looming replacement surgery, etc. Now today reports have come out that Landis's urine sample after that epic stage 17 ride showed unusual levels of testosterone. If he won by cheating then it would be the worst scandal in cycling history considering he is the TDF winner. And given cycling's history of doping, that is saying something. Critics will say that the fact that it was after that unbelieveable ride in stage 17 circumstantially proves that he cheated, because no one could believe that he did what he did. But I do not think that Floyd cheated to win. I am not saying that there might not be "unusual" levels of testosterone in his urine sample from that day. I just think that he didn't cheat to win. Cheaters in cycling don't pump themselves with testosterone because it is so easily traceable; they tend to use EPO and other designer type drugs that are much more difficult to detect. Additionally, from all reports Floyd knew from the night before stage 17 that he was going to try his go for broke super attack the next day. Knowing the Tour's policy of automatically drug testing the winner of each stage as well as several others at random, why would he juice if he was trying to win the stage? Floyd has a reputation as a very clean guy. It seems more likely that his elevated testosterone level was the result of the cortisone shots that he takes for his jacked up hip, or perhaps from the daily medication that he takes for a thyroid problem, or both. He has denied the doping allegation in an exclusive interview with Si.com that is certainly worth a read. Landis adds in the SI article: "In hundreds of cases," Landis told me, "no one's ever lost one." So we'll see what happens, but I'm falling on the he didn't cheat side of the fence. Seems to me they are calling it elevated. Campared to what? Lance? He only had one nut, so comparing it to him, everyone would be elevated!